Don't guess. Give modern clothing sizes in the space provided. Usual shipping time on custom orders is 6-12 weeks. Common sizes and items off the rack can be shipped immediately. Please also note that larger or odd sizes could cost extra. Buttons are included in the price of each garment. State buttons or special buttons may cost extra. Please refer to the "BUTTON NOTE" and "SIZE vs PRICE" notes at the bottom of this page. There is a 25% extra charge for extra quick delivery on custom orders. 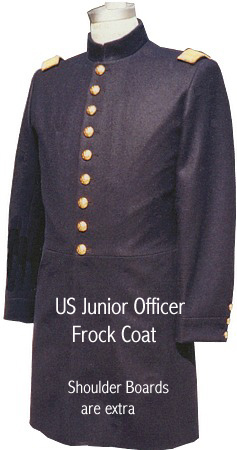 Junior Officers Frock Coat, for Lieutenants and Captains. Single breasted and has a nine button front. 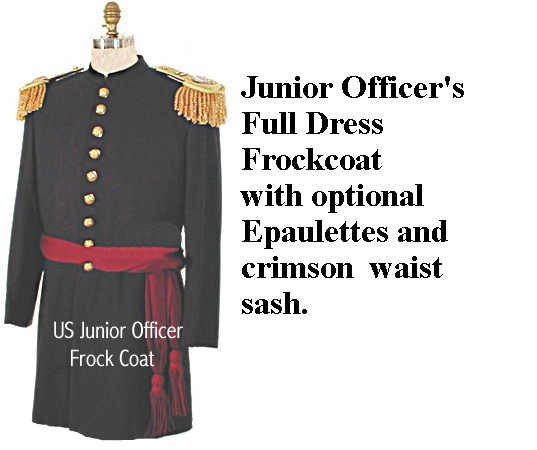 The Full Dress version is shown at left (Epaulettes and Waist Sash are optional). The Undress version shown at right. For branch of service buttons (Eagle w/I, A, C,) $1.50 each extra. 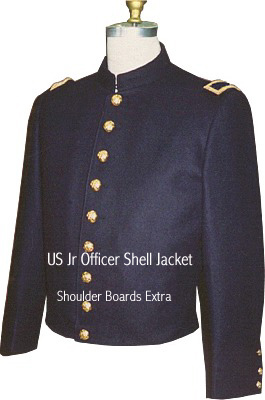 For US Officer's Letter buttons, add (Frock Coats-$28.50 , Shell Jacket-$22.50 - specify letter desired ( A,C or I).